These are popular thin cuff bracelets which are worn alone or stacked and layered with other bracelets. Several can be worn with each other, mixed or matched, or any which way you�d like. Customize your order with whatever you�d like to have stamped on them; favorite saying, names, initials, dates, medical alerts, whatever will fit I'll stamp for you, and they are comfortable to wear anytime, anywhere, and any season. They make wonderful any time gifts for yourself or your best friends, are affordable, and you�ll have your custom order in almost no time. Available in copper, brass or German silver. How to order: Pick your bracelet type from the �options� section above. 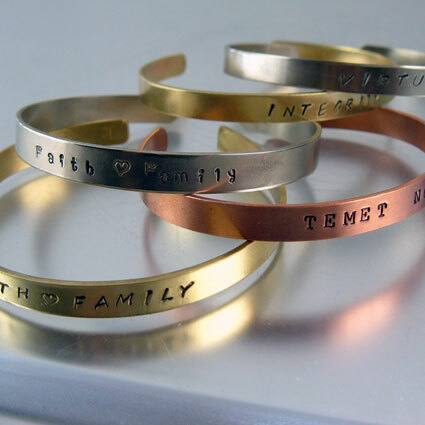 At check-out in the �comments� section make sure you type in what you�d like to have stamped on your bracelet; all upper case, upper and lower, or let me choose the best way it would look. Its that easy! 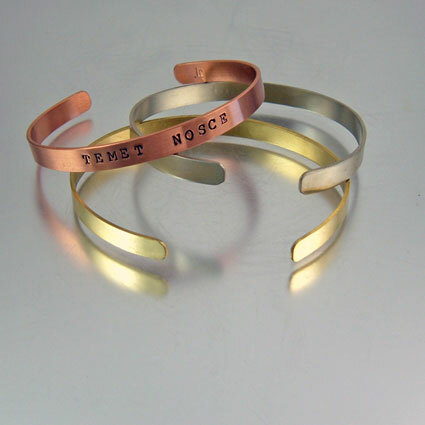 CONCERNED ABOUT WEARING COPPER, BRASS OR GERMAN SILVER? Here's all the information you need to know about copper and metal jewelry.